This software developer uses payment security and mobile payments as two ways to increase success in the healthcare vertical. Computrition is a software provider that’s taken a focused approach to a single vertical. As a designer of software for the food service departments of hospitals, the ISV realized it could leverage its strong market position in healthcare by developing and selling software for hospital cafeterias and other retail centers within a hospital. A great example of this can be seen with one of the ISV’s recent wins. Computrition was approached by a large healthcare system in Texas looking for a new POS system for its cafeteria. Eric Lipsitt, director of retail solutions at Computrition, explains that one of the keys to winning the business was knowing what’s important to healthcare customers. “Hospital IT departments are keenly aware of security, having to meet stringent HIPAA (Health Insurance Portability and Accountability Act) requirements in safeguarding patient records,” he says. “When we say that our software is 100% PCI compliant and explain how we safeguard a customer’s credit card information, the IT decision-maker responds well.” Of course, there’s no HIPAA requirement related to the safeguarding of credit card info, but the point is that hospital IT people understand the concept and value in security. In the case of the Texas customer, security was a significant reason why Computrition won the business. The solution Computrition installed for the customer included its own SuitePoint! POS software for three hospitals covering eight retail locations: three cafeterias, a gift shop, a doctor’s dining lounge, an outpatient counter-service location, a yogurt bar, and a coffee kiosk. SuitePoint! POS is one of three main applications that, together, are called Computrition Hospitality Suite. The Hospitality Suite contains SuitePoint! POS, Foodservice Operations Management, and Nutritional Care Management applications. All told, the total solution utilized 11 Radiant POS all-in-ones and 16 VeriFone MX860 terminals. The ISV selected the MX860 for a handful of reasons — the biggest being that the unit has P2PE (point to point encryption), meaning that all cardholder data is encrypted at the point of swipe and no sensitive data is stored or accessible to criminals at any point in time. The combination of the MX860 and PayWare Connec payment gateway means that Computrition’s solution is PCI-compliant. Once working with this customer, Computrition was able to identify other potential areas for business. 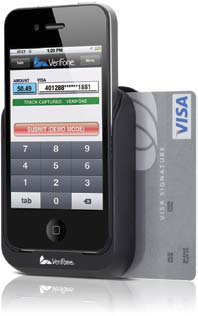 For instance, the ISV has a mobile POS solution, which uses an iPod Touch that snaps into a VeriFone PAYware Mobile Enterprise card encryption reader. The device is able to scan bar codes and accept card swipes. The hardware ties into the Computrition Tray InMotion software system, which can track meals of patients and guests from the kitchen to the rooms. There’s also integration with a nutrition system to ensure patients are getting the right foods and avoiding ones that can put the patients at risk. While patient safety is a hospital’s main concern, there’s also a financial benefit to ensuring patients get the right meals. To date, Lipsitt says the healthcare system has been so pleased, they have extended the implementation of SuitePoint! POS to two more hospitals with 8 more POS terminals and 10 additional VeriFone MX860 units. Beyond this one customer, Computrition is seeing big success from other healthcare systems. For instance, in 2011, the ISV had installed 83 SuitePoint! POS lanes in 22 hospitals. As of July 2012, the company added 27 additional hospitals, including 72 lanes.